The funeral service for Ida Adeline Heupel, 98, of Aberdeen, SD, will be 10:30am, Monday, January 21, 2019 at Zion Lutheran Church, with Pastor Mike Jacobson officiating. Burial at Sunset Memorial Gardens. 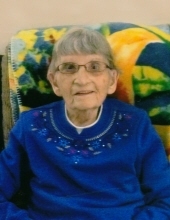 Ida died Thursday, January 17, 2019, at Prairie Heights Healthcare in Aberdeen, SD. Visitation will be 3-7pm, Sunday, with family present from 5-7pm at Spitzer-Miller Funeral Home, 1111 South Main Street. Ida Adeline Rohrbach was born November 16, 1920, at Hosmer, SD, to George and Christina (Wolff) Rohrbach. As a small child the family moved to Long Lake, SD, where she grew up and attended school. On January 31, 1939, she married Julius E. Heupel at Long Lake. They made their home on a farm near Long Lake until 1950 when they moved into town. She worked for the cream station until 1953 when they moved to Hosmer, SD. In 1957 they moved to Aberdeen, where she worked for Pepsi Cola for several years. She worked for Northern State College for several years. Through the Green Thumb program, Ida started working in the daycare at Bethesda Home of Aberdeen for three and a half years until 1990 when she started working for K-Mart as a greeter. Julius died on February 13, 1986 in Aberdeen. Ida moved into the 5th Avenue Apartments and was there for 26 years. Ida was a member of Zion Lutheran Church. She was also a member of the Eagles Aerie Auxiliary in Aberdeen where she was very active. She loved music, playing the piano and singing, including singing with The Kitchen Band. Ida also loved to dance. She was a baby sitter for many years and also became a foster grandmother. Grateful for having shared Ida’s life are her children: Harlan (Jarlene) Heupel, Groton, SD, Ted (Marge) Heupel, Aberdeen, and Betty (Edward) Krueger, Hartford, SD; Ida’s grandchildren: Robert (Lynn) Heupel, Darlene (Russ) Sass, Jason Heupel, Luke (Andrea) Heupel, Barbara (Jack) Dodson, Mark (Stacy) Lappegard and Richard Lappegard, Jr.; Ida’s siblings: Ted (Rose) Rohrbach, Crystal River, FL and Darlene Graff, Rapid City, SD; her sister-in-law: Sylvia Rohrbach; fifteen great-grandchildren and eight great-great-grandchildren. Preceding Ida in death are her husband: Julius Heupel; her parents: George and Christina Rohrbach; daughter: Kathy (Richard) Lappegard; brothers: Donald Rohrbach and Eugene (Arlene) Rohrbach; sister: Metha (Eugene) Graff; and brother-in-law: Reinie Graff. To send flowers or a remembrance gift to the family of Ida (Rohrbach) Heupel, please visit our Tribute Store. "Email Address" would like to share the life celebration of Ida (Rohrbach) Heupel. Click on the "link" to go to share a favorite memory or leave a condolence message for the family.